Choose garments loose enough to permit a good range of movement (in particular avoid restrictive waistbands, shoulder straps, and underwire bras), yet not so baggy that they catch on limbs or fall off when you bend over. Women engaging in jogging and other jerky movements might feel more comfortable in a sports bra. Layers are vital for sports in which you start cold then get hot. Choose pure wool base layers for dryness and comfort. You need the right shoes for whichever activity you choose. For activities involving jogging, running, or jumping, choose cross-training shoes with cushioning and other built-in features to support the spine (some shoes have cushioning specially positioned for beginning runners). Ask advice at a sporting goods store (rather than a fashion sneaker store); even better, shop at a gym selling sports equipment. Appropriate socks are important: some running socks have mesh sections for air circulation and are seam-free to prevent blisters. 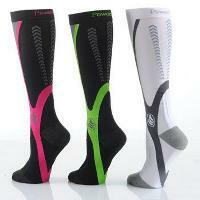 Try outdoors or extreme-sports stores for socks with cushioning and in a range of performance fabrics. If communal changing rooms make you feel anxious, put on exercise gear beneath regular clothes before you go or choose sessions at a quiet time of day. Do a tour of all the local sports centers to find a place where you feel comfortable. 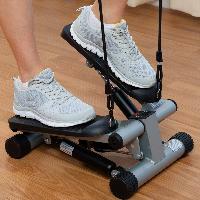 As you become more addicted to the endorphin high that follows a good exercise session you might feel less concerned. Buy a real yoga mat (not a camping mat) with a sticky finish to prevent palms and soles from slipping away from each other in postures such as downward dog and triangle-based legwork. Support should be so effortless that you forget you�re on a mat. Mats that retain the outline of feet when you step away are useful for checking alignment. Make sure the mat can be machine washed without disintegrating. Choose a color you love: the more attached you are to your yoga mat, the more you�ll want to put in practice hours. If you�re prone to perspiring, take a towel along to your exercise class. Use it to wipe brow and hands (to prevent slipping) or as a hygienic layer if you have to lie on shared mats. A rolled-up towel can be useful to cushion bony parts of the body when working on a yoga mat, or to provide support beneath sitting bones or heels in certain postures. Yoga foam or, even better, cork blocks help you into poses you could not otherwise achieve. They are used in some types of yoga not only by beginners, but by experienced practitioners to achieve lift, opening, or support that allows a student to extend farther, reach higher, or sink more effectively. Don�t buy them before you start a class; see what the teacher advises (various schools of yoga have different thoughts about their use) and try a selection of thicknesses and shapes in class to see which you prefer. Some poses call for the cushioning of a firm bolster. Some forms of fitness training are based around a large inflated ball. 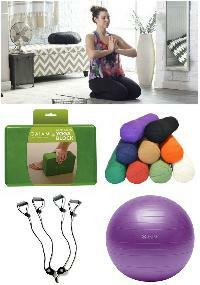 Sit on it to practice balancing, lie over it prone or supine for sit-ups, back extensions, and push-ups. Or lie on the floor raising legs against the ball to isolate action in one set of muscles and prevent larger, more often used muscle groups from taking over. Do attend a class to learn the basics with a trained instructor, since balls are fun but can be challenging to stay on. Flexible bands might be called for in toning classes in place of hand weights to provide enough resistance for an effective bicep curl or side raise. Don�t buy your own until you�ve tested them out in class and know how they work. Buckled fabric belts are used in yoga to help students into poses, for instance, when unable to reach toes or keep legs in a crossed position. They are extremely effective. Always take a blanket to yoga. It�s useful to cushion ankles, knees, and hips in sitting and prone postures and is essential for final relaxation, when you lie on your back without moving for up to 10 minutes. The body cools quickly when motionless, so covering yourself with a blanket is vital in winter and in cold studios. Being covered up adds to the sense of retreating within to find inner calm you may find you don�t want to emerge at the end of the session.